One great thing about braids is that it never goes old! Thank God I’ve learned to braid from my mom and thanks to my barbie dolls, I’ve got tons of practice. I would like to say that I’m a pro when it comes to braiding but the truth is that I’ve only managed to braid my hair from the back just a few years ago. Till this day, I still mess up. Lucky for me, I can safely say that braiding is definitely a universal style most girls know how to fix. My bestie is in town and she’s didn’t fix just a normal braid but a Dutch braid for me #likeapro! I LOVE IT SO MUCH that I wore my braid like a crown! And now you too can “get the look.” All you need preferably is have a slightly dirty head of hair, a comb, hair ties, pins and hairspray. Part your hair to the side. You can part it where you normally would, or you can go for the more dramatic look and part it over further. Then take a small section of hair from the part and start your dutch braid. 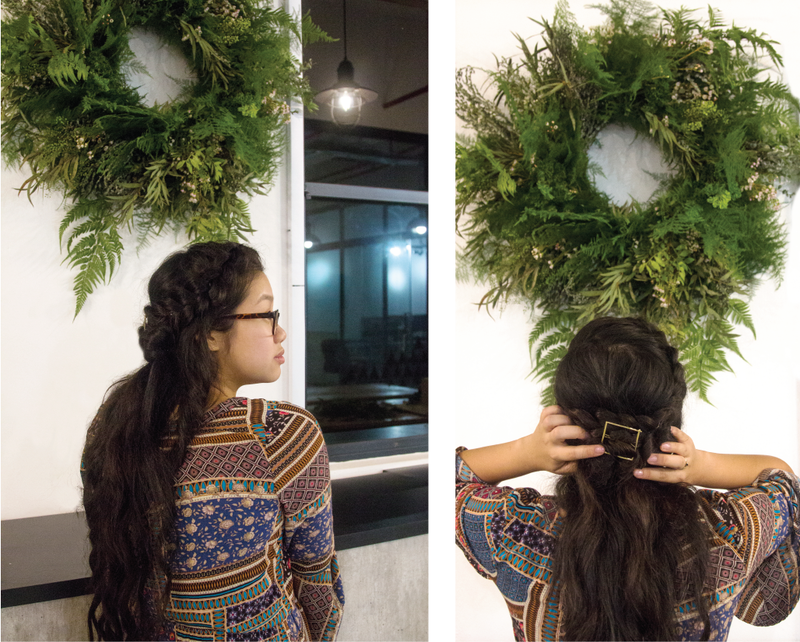 Braid a good ways down, and make sure to leave some hair at the side around your face so you can have some soft curls. Once your braid is done you can tie it off with a hair tie to keep it in place. 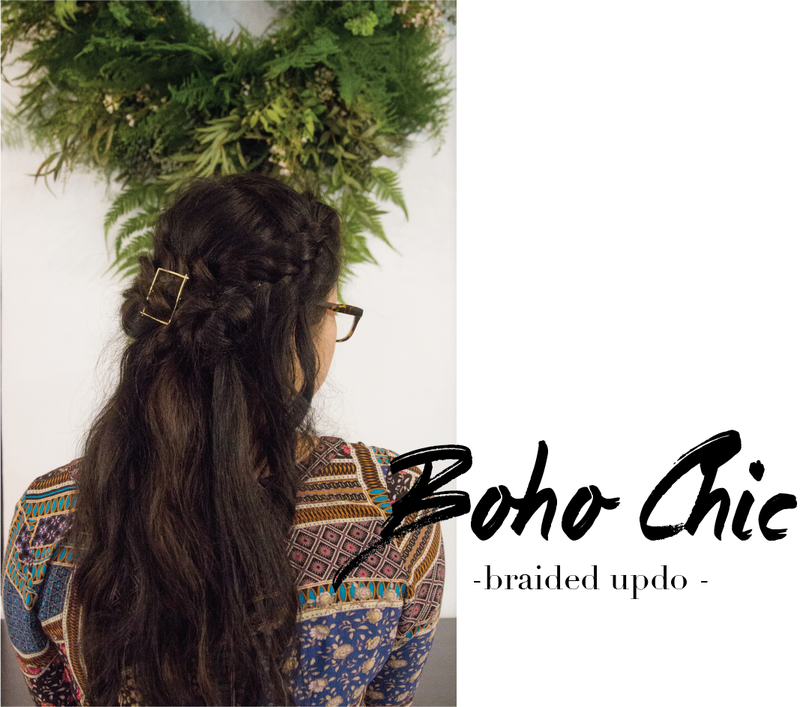 To make your braid has that true boho look, you can pull it out to give it more volume! Tug at the opposite sides of the braid starting from the bottom till you reach the top of the braid that is closest to your roots. If you want to give your hair more volume, section off a part and tease your hair close to the roots. Then take your braid and use it to push up some of your teased hair. Pin down your braid across the back of your head. I did a mini bun near to the braid to give more layers to the hair. After curling the hair I took some sections of hair and created some small knots. Do not pin up all the hair, but leave a length of hair out. You can add as much hair as your want to the bun, but make sure to pin it close to the braid so it looks like it is a part of whole braid. Finish the look with some hairspray. Viola! Your boho chic updo is completed! Photography and styling by Mikayla.